Imagine what a small colony can do, all without the harmful effects of pesticides. 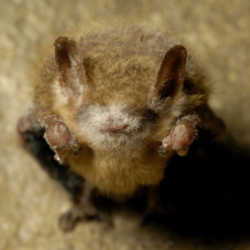 Many species of bats also eat moths. Each moth a bat eats represents that many less caterpillars waging war on your plants. Because it is high in phosphorus, bat poop (a.k.a. guano) is actually sold as natural fertilizer by a number of companies. It doesn't increase soil acidity, and won't harm children or pets. You can collect the guano from under your bat house to use in the same way. Be careful not to use old guano-especially guano left in an attic after the bats have been excluded -- as over time, guano can (given the right conditions) develop the spores that cause histoplasmosis, a lung disease that is potentially fatal. This is, however, rare. 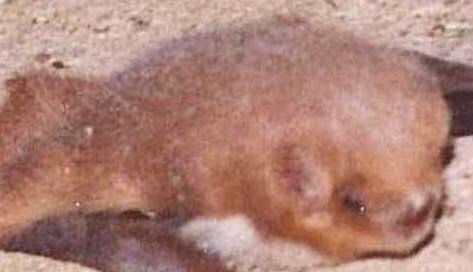 Many people dislike bats, either because of old wives tales such as the one that they will cling to your hair, or because bats have invaded their homes. 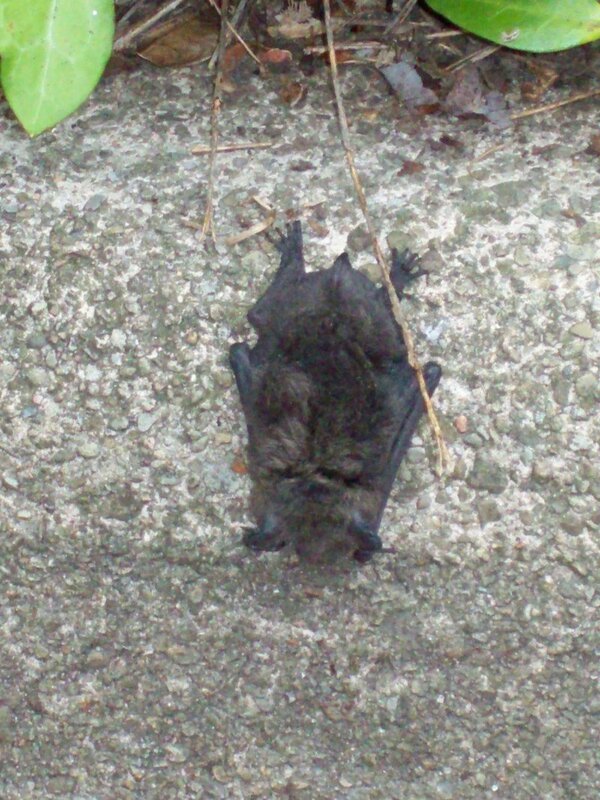 If bats have nested in your attic, it is a simple matter to exclude the bats by blocking their entrance when they have left the premises for their nightly hunting. You want to make sure that you do this at a time of year when the bats are not reproducing. Make sure all the bats have flown, and that there aren't any pups left inside the attic. You can purchase sturdy pre-built bat houses at many wild bird supply stores, but it isn't difficult to make your own. A quick Google search will give you dozens of options for building plans. That way, you can make it truly fit in with your garden -- whether you hang your bat house proudly on a pole or place it discreetly on the side wall of your garden shed. Before you get started on this project, make sure there are bats native to your area that will occupy bat houses. 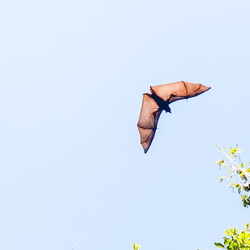 Some, like this Eastern Red Bat, prefer to roost in trees. A bat won't mind if you decorate the outside of his house (as long as you make sure you use non-toxic paint and/or adhesives), but never paint the inside. I painted the bat house in the above photo black because it helps add a small degree of warmth for the bats. Remember to scuff the wood a bit at the entrance to the bat house to help the bats land. It doesn't have to be dramatic. Bats can cling to tiny crevices, like these pebbles. Whatever design you use, make sure the bats have sufficient ventilation inside the house. Also make sure that you place the finished bat house where the bats will be protected from predators (for example by making sure the pole isn't easy to climb). You don't want to attract bats into the neighborhood just to make them a snack for local cats or snakes. Likewise, be careful about placement near trees that would provide roost for predators from above, such as hawks, owls and even, occasionally, blue jays. Providing the bats with a properly-designed place to live that is not your attic ensures that everyone benefits and co-exists peacefully. 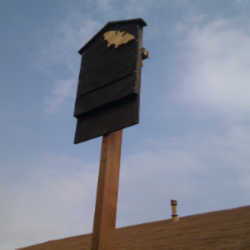 Other considerations for a successful bat house instillation are provided by Bat Conservation International at http://www.batcon.org/pdfs/bathouses/bathousecriteria.pdf . *Or other similar-sized insects. Only certain species of bats eat insects. Some bats eat mostly fruit. Also, different species of bats have preferences for certain types of insects on the menu.